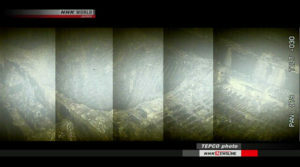 NHK produced a stitched together photo of a 2 meter wide hole found in the pedestal area of Fukushima Daiichi unit 2 today. 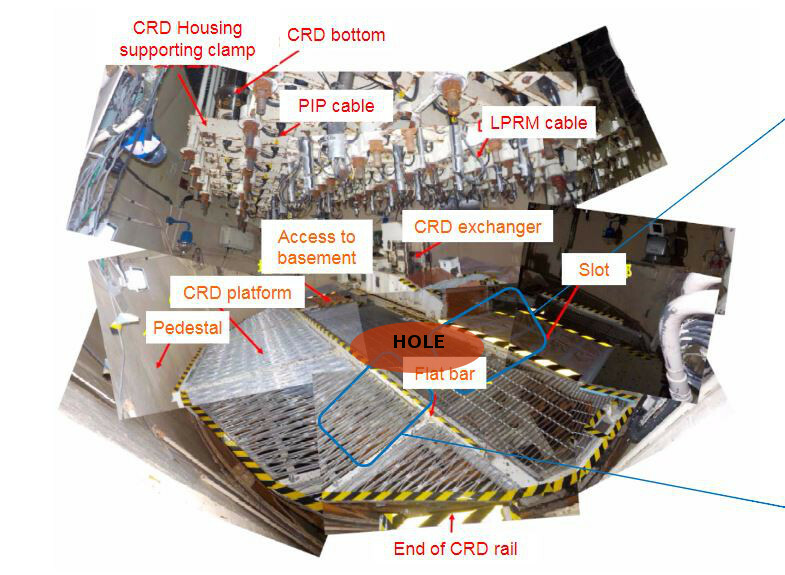 This includes images not initially released by TEPCO but clearly shows a large hole melted into the center of the pedestal grate. Radiation levels of 530 Sieverts/hr were found in this area. Our previous report this week outlines how these new findings match with our current theory and computer modeling estimates of the meltdown at unit 2. This large but concentrated hole appears to be the failure point for the unit 2 reactor pressure vessel (RPV). Melted fuel (corium) likely flowed through this hole and collected into the sump in the containment structure floor. The slow failure and small opening melted through the RPV likely allowed the molten fuel to burn down as it collected in the sump. This new visual evidence shows conditions that could have led to the molten fuel burning down into the reactor building concrete basemat. Without sufficient cooling, it could have potentially burned down through the basemat. This is a major development in understanding the meltdown of unit 2 and how work to clean up the reactor might take place. TEPCO’s claim has always been that they thought most of the fuel remained in the RPV. The effort to put a robot into the pedestal is now on hold. TEPCO apparently had assumed the grate and other structures in the pedestal would be intact. Reality has caught up with TEPCO’s corporate compulsion to only give the most positive potential scenario. What has been found confirms what many researching the disaster have assumed. It will require IRID and TEPCO to now admit the massive failure of unit 2 and to now address a more realistic approach to dealing with this unit. The question remains, where is the bulk of the fuel located and did it burn fully through the basemat concrete to the ground below. The graphic below of the identical pedestal structures at unit 5 shows what the inside of unit 2’s pedestal would have looked like before the disaster. With this and the NHK image we were able to identify the exact location of the melt through hole. The melt through hole is beside the CRD exchanger and close to the center of the pedestal. This is also directly over the area of the sump pits in the containment floor. 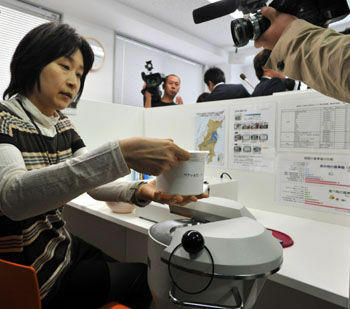 The image below was published by TEPCO today. It is a series of stitched together images that show a top to bottom view of the section where the hole resides. 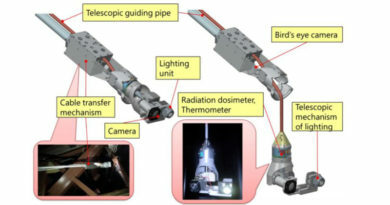 In the top, the control rod system hydraulics can be seen. As the image pans down the CRD exchanger can be made out. Then the hole and other structures as identified in the unit 5 image. Below the marked up image is an unmarked copy for comparison.